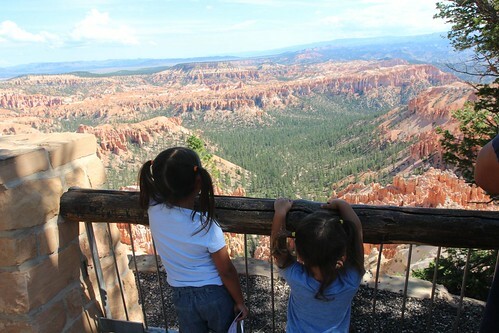 Mali Mish - Day 4: Our Junior Ranger at Bryce Canyon National Park. We got a fairly early start this morning considering both of us went to bed well after midnight. I actually only got about 3 hours of sleep but I am not going to let that get in the way of our big plans today. 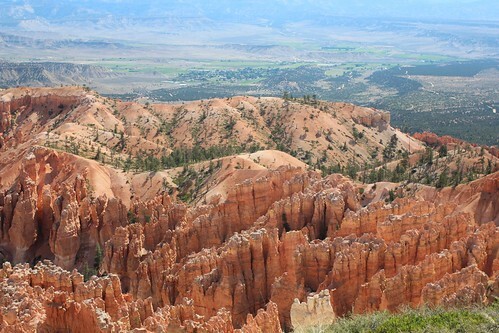 Our destination today is Bryce Canyon National Park about 20 miles up the road from us. The scenery around this part of the country is truly breathtaking. The wide open spaces, the evolving ecology with the constant elevation change and the iron-oxide colored hills make this area so unique. The drive seem to take no time at all and there was no traffic heading into Bryce. 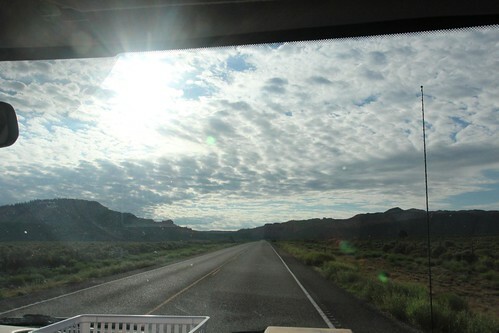 Since we didn’t have to tow the Airstream, it made the drive that much more pleasant. 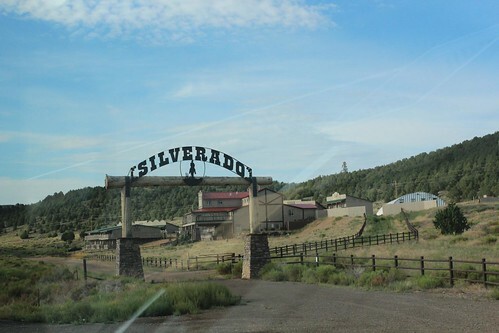 On the way between Panguitch and Bryce Canyon, there is a decommissioned lodge named Silverado on the side of the road. It is really a shame as we could tell how great of a place it must have been while it was open. There is a huge lodge as well as a couple dozen cabins on a very scenic property. I don’t know much information about it but I bet there is an interesting story about its demise. 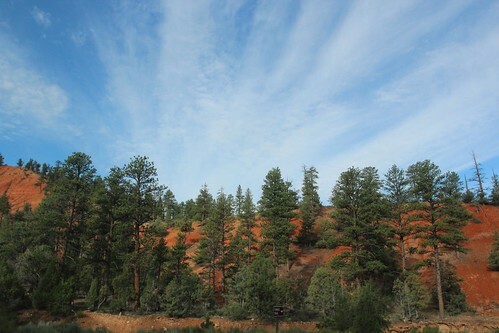 As you travel from 6,600 feet where Panguitch sits to the 8,000 feet plateau where Bryce Canyon is located, you can tell that the high desert landscape quickly fades away to a beautiful Ponderosa Pine forest. The girls were excited to finally get out to see something new. This being our first National Park in awhile, we wasted no time to purchase our annual park pass. 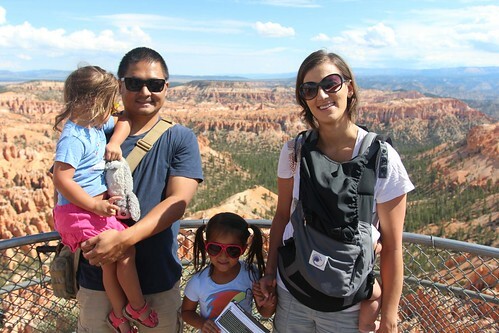 With a family like ours on a trip like this, it is a no brainer. The shuttles pick people up right at the parking lot so you don’t need to drive your car into the park. It runs every 15 minutes and can take you to every corner of the park. We parked the van at the shuttle parking lot across the street from Ruby’s Inn where we contemplated staying. They have a nice campground with full hookups but we were glad to have decided against it. Even though it looked like a great place, we found out that the cell phone service is pretty bad. Since I need to have Internet and there is definitely no 3G or 4G service, it would have been a disaster on the work front. 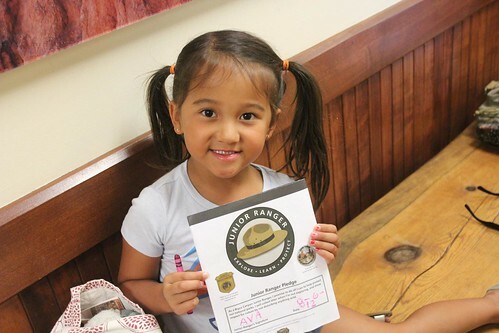 Now that Ava is 5 years old, she can start collecting her Junior Ranger badges at all of the participating National Parks. 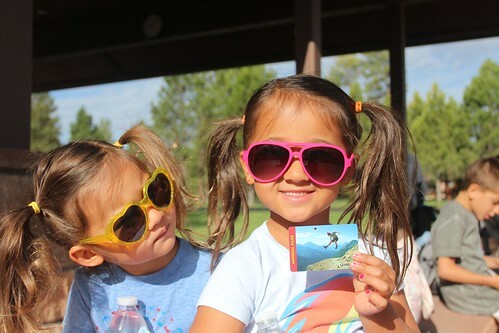 Not only is it a fun project for her, it is also a great way for kids to learn about everything there is to know at the park. The rock formations that seem to rise straight up from the canyon floor are called ‘Hoodoos’. Native American legend has it that they are petrified people who were tricked by the trickster coyotes and turned into stone. In reality, these rocks are caused by the natural erosion that occurs here in southern Utah. Hundreds of millions of years ago, this area was actually in a shallow sea. What became the North American continent was actually split right down through here by the Pacific Ocean. Over the millions of years since then, different types of sedimentation from varying climate changes have developed the layers that are now seen in the cross sections of the hoodoos. In the last 25 to 50 millions years, pressure under the surface of the earth has pushed this area up nearly 2 miles above sea level. At this elevation, Bryce Canyon has about 180 days a year when the night time temperature would drop below freezing causing moisture in the rocks to expand. As the ice melts the following afternoon, the ice turns to water leaving a crack in the surface. This process happens over and over again and is what causes the rocks to have such a unique shape. This is a rare family photo we asked someone to take for us. And of course, someone is not looking at the camera. There is a reason for that, Mila got up early today and badly needed a nap. Sorry little one, we will be back in the car soon. We hopped back on the shuttle to Sunset Point to catch a ranger’s presentation as part of Ava’s Junior Ranger requirements. 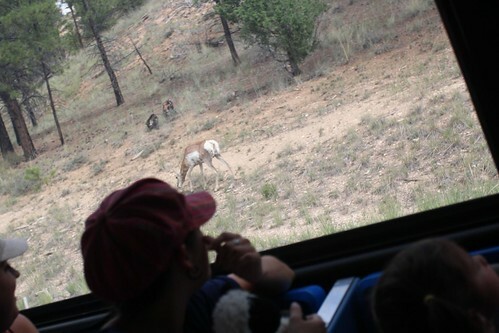 As we were riding in the shuttle, right out side the window, we were surprised to see wildlife out and about in the middle of the day. Luka spent most of the day attached to Marlene inside the Ergobaby carrier. 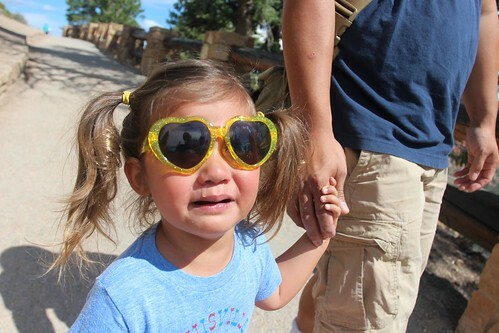 It got a little warm so while Ava was busy learning about the hoodoos, he got to come out and see his first National Park. 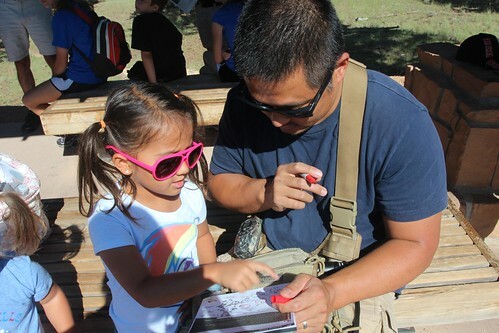 Some of these kids are quite the pros at this junior ranger thing. Ava has her work cut out for her. 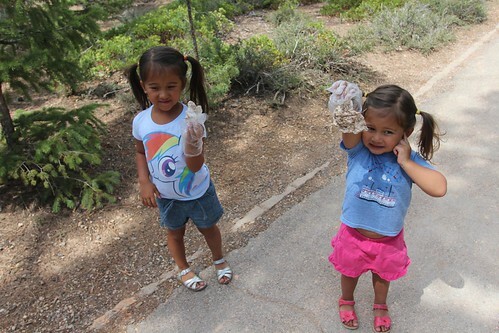 One of the things a junior ranger candidate needs to do is to help clean the park by pick up litter. Mila got into the action and they tagged team their way all through Bryce Canyon. Of course their hard work never goes unnoticed. 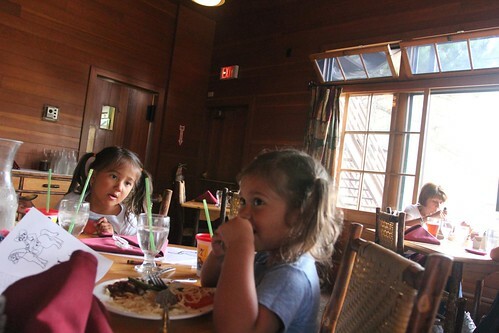 We stopped at the Bryce Canyon Lodge for lunch to fuel up our little trash pickers. This lodge was built back in the 1920s by the Union Pacific Railroad as they recognized the tourism potential of the area. The food was surprisingly good and pretty reasonably priced. I think Ebenezer and Mary Bryce would be proud of what we’ve done with his backyard. 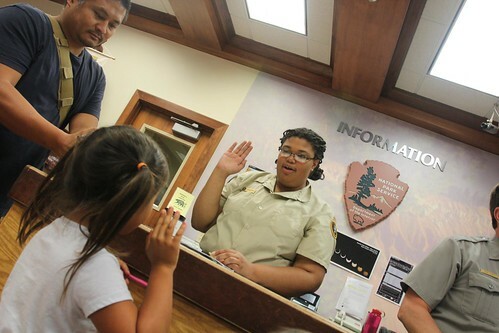 With her projects complete, we headed back to the visitor’s center for her official badge ceremony. I think this might be the first time she has ever raised her right hand and repeated after someone. 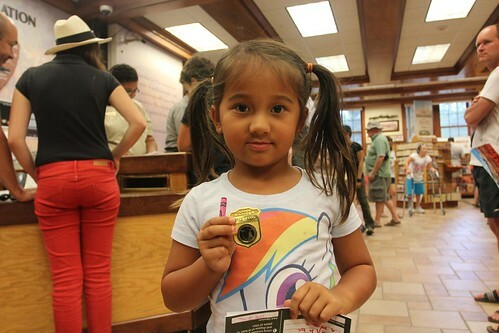 Check her out, our very own Bryce Canyon National Park Junior Ranger! Since Mila is 2 until next month, she is a little young to work on these projects. She was not too thrilled that Ava got a badge and she didn’t. After all that trash she helped pick up for her! Sorry Mila, we will help you get one at the next park after you turn 3 next month! 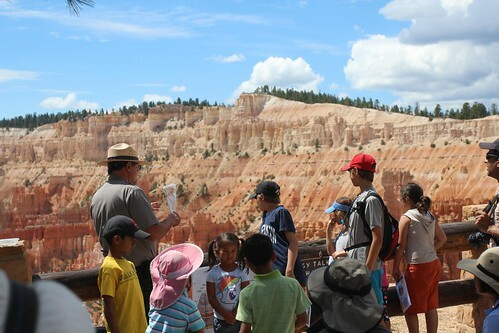 7 Responses to Day 4: Our Junior Ranger at Bryce Canyon National Park. I love Bryce Canyon! It was one of the first places I hiked with Steph. Getting down on the floor of the hoodoos is such a neat experience! 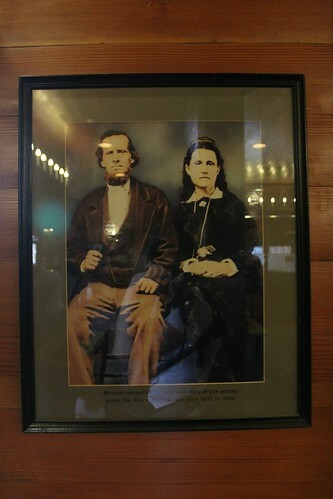 We stayed at Ruby Lodge and it was pricey…nice call on finding the $25 spot. 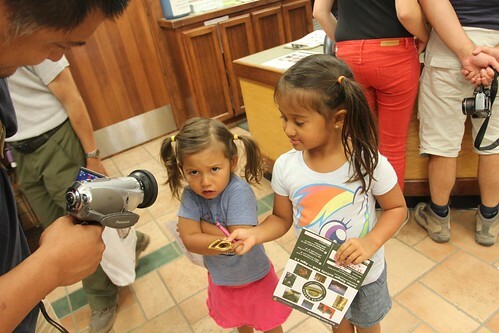 Congrats Ava on becoming a junior ranger 🙂 I started my National Park tour when I was 25 and sadly I was too old to participate in the program 🙁 Dan & Marlene…if I recall correctly they have a really cool star gazing program in the park. Not sure how far your campground is or if Luka would put up with being outside for that long for star gazing, but you should check it out. P.S. Are you going to the Grand Tetons or Yellowstone this year? Poor little Mila her facial expression is priceless. Next National Park have something to give to her. Love all of the new blog posted and the videos are SO fun! Great job! @Charlene: Mila’s faces crack me up too. And don’t worry, she got to pick out a kids book for herself. And she picked one about pollution. Haha. And yes, hit the road next summer. The kids will love it!!! I love the new entries and the style of your videos. Don’t get too slick with your editing or you will lose the unique character. Right now, the videos are pitch perfect. You are striking the balance between family videos with just enough production value. 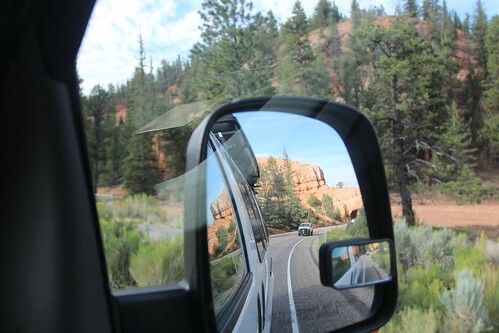 Utah is a wonderful state to explore with an Airstream. There are so many great options. It really makes me want to hit the road. The family is adorable. Lucy likes watching your daughters in the videos. Girls are the same everywhere. I know all too well the moments when the older kids is able to do something that the younger ones can’t do. That will continue well into the future. You are more than welcome to stay with us for a weekend in the fall. However, I must adjust your expectations. Although the leafy suburbs we live in are charming, they hardly match the grandeur of the American West. Happy travels. Thanks Douglas, don’t worry about the videos getting too slick 🙂 It’s tough as it is trying to edit a 10 minute video each day and uploading it with unpredictable connections. I think if anything, the videos will get shorter but definitely not higher production value. I am looking forward to meeting your family in person soon! 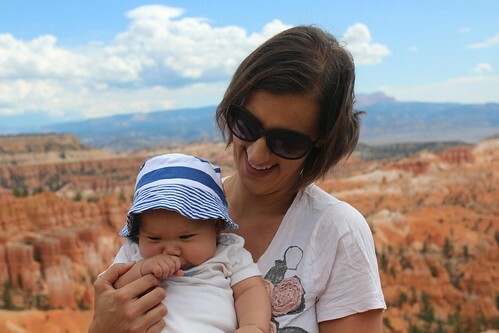 We loved Bryce Canyon when we were there. Such beautiful country all around. If you’re still in that area, check out Best Friends animal sanctuary if you can. It’s pretty close to there and the kids would love it. They give really great tours.